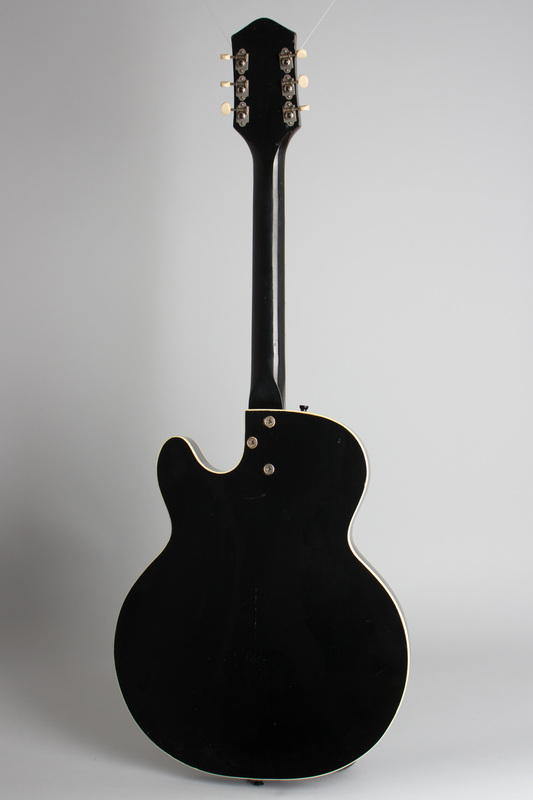 Silvertone Model 1446L Model Thinline Hollow Body Electric Guitar, made by Harmony (1960's), made in Chicago, black lacquer finish, laminated maple body, maple neck with rosewood fingerboard, black gig bag case. 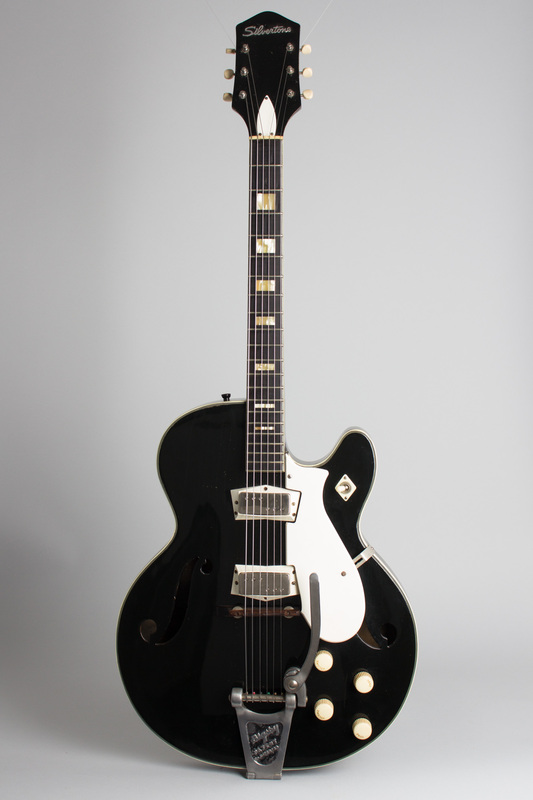 One of the very best guitars ever sold through Sears-Roebuck, the Silvertone 1446 is both a sharp-looking and great-sounding guitar. 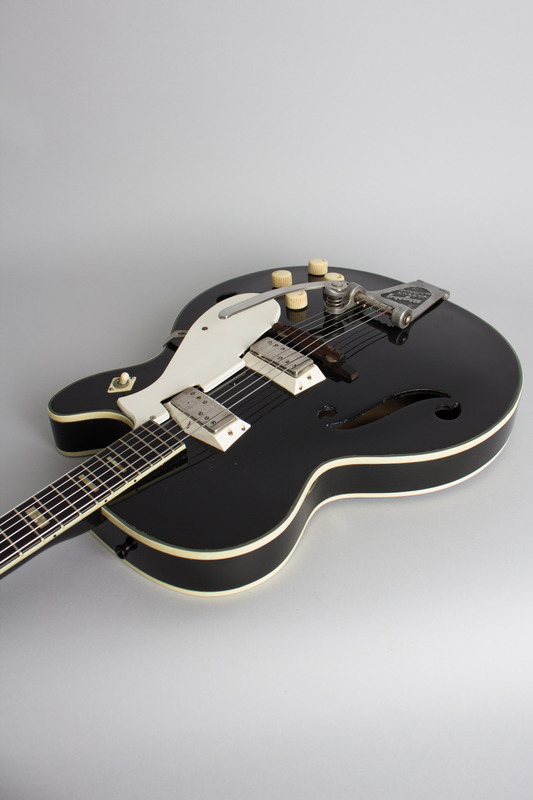 This unique model combines a sharp-looking ebony finished Harmony thinline hollow body and deluxe pattern neck with a Bigsby tailpiece and unique mini-humbucking pickups supplied by CMI/Gibson. 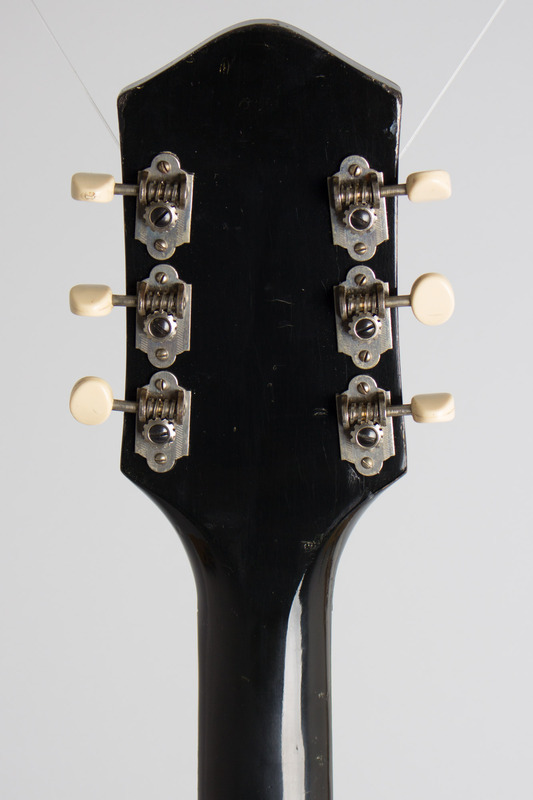 These are the same units used on the contemporary Epiphone line, the only difference being a 3-and-3 staggered polepiece pattern as opposed to the straight line, probably to differentiate them visually rather than for any strictly musical reason. The odd-looking white plastic trapezoidal mounting bezels are also unique to this model. 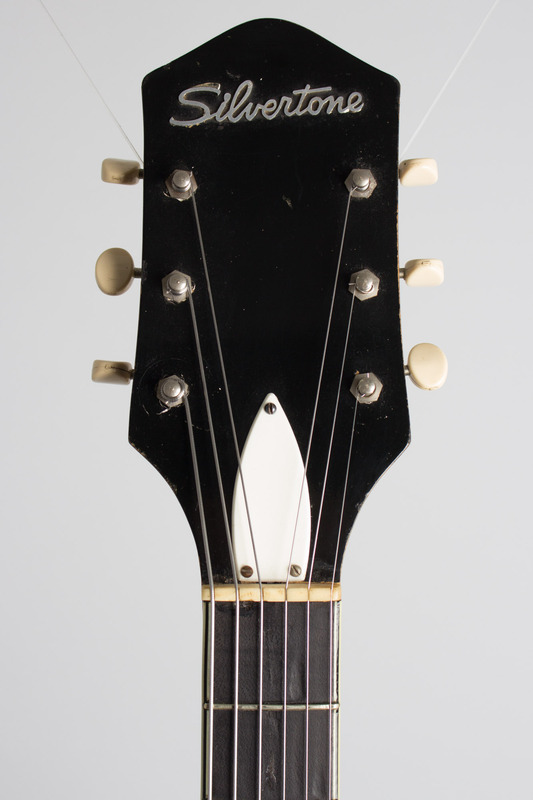 This combination of features makes for a very professional instrument for a Silvertone, and a guitar that has a justifiable reputation as arguably the finest Harmony-made electric guitar of the 1960s. This one has no legible date codes (Harmony sprayed black over their own factory stamps! ), but this model was only in production from 1961-67. 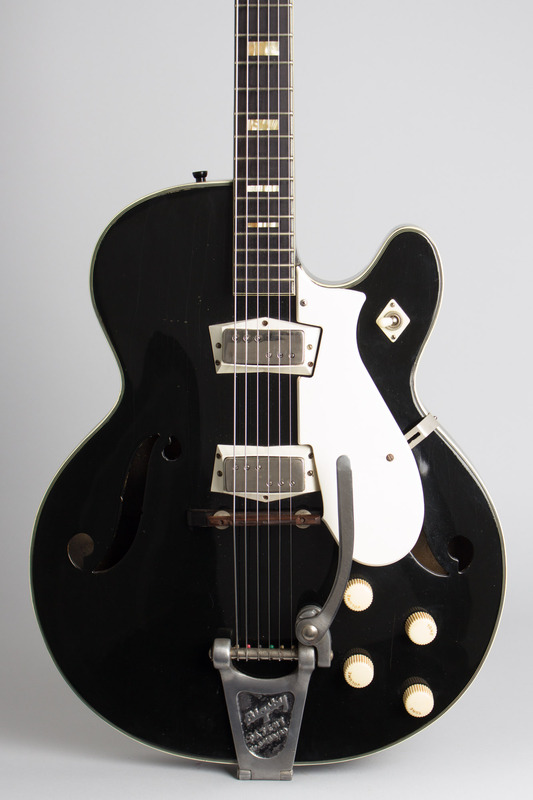 The 1446 is often unofficially named for Chris Isaak, who was seen with one quite a bit -- back before Harmony and Silvertone were considered "cool"! Overall length is 40 3/4 in. (103.5 cm. ), 15 3/4 in. (40 cm.) wide at lower bout, and 1 7/8 in. (4.8 cm.) in depth, measured at side of rim. Scale length is 24 in. (610 mm.). Width of nut is 1 3/4 in. (44 mm.). This guitar shows some general wear but remains in excellent playing condition, complete and original except for a replaced bridge top. There are scuffs, scratches and dings to the finish, but no major loss. The fingerboard shows some divoting in the first position and a small fill at the 2nd fret. 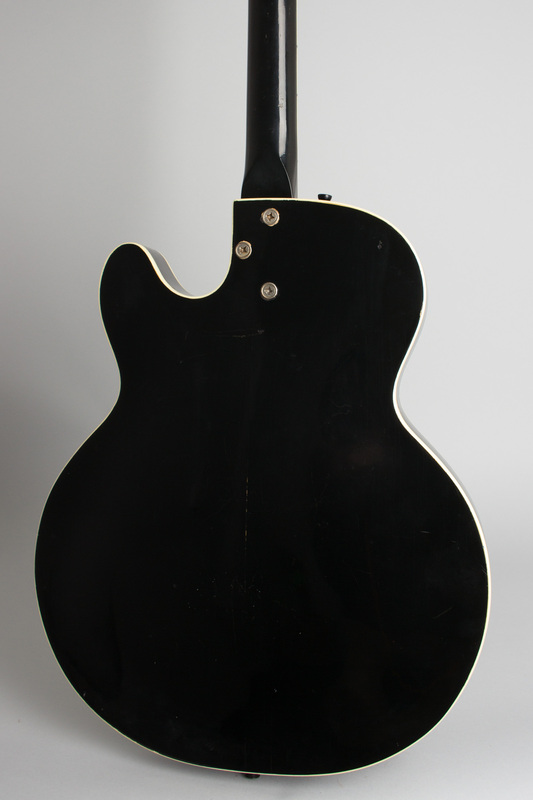 The fragile white plastic parts-the molded pickguard, pickup bezels and switch ring-are all present and intact. There is a small repaired crack at the jack, as is very common with these. This 1446 sounds fantastic, a very cool looking guitar with the tonal muscle to bely its original "budget catalog instrument" status. Excellent - Condition.